View from the bridge to Glen Aulin. A swimmer and the falls at Glen Aulin. Tuolumne River, Cathedral Peak and Unicorn Peak. 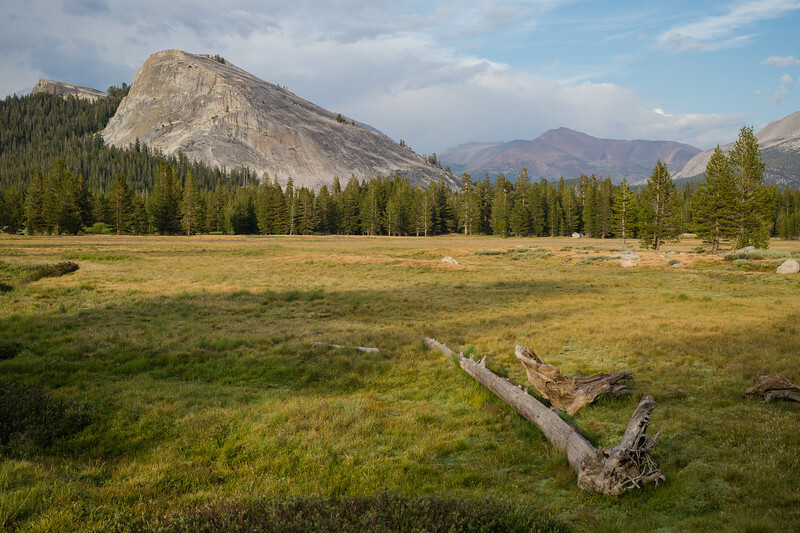 Lembert Dome and Tuolumne Meadows. While at Yosemite last week, I dayhiked to Glen Aulin and back, stopping to fish and take pics along the way. 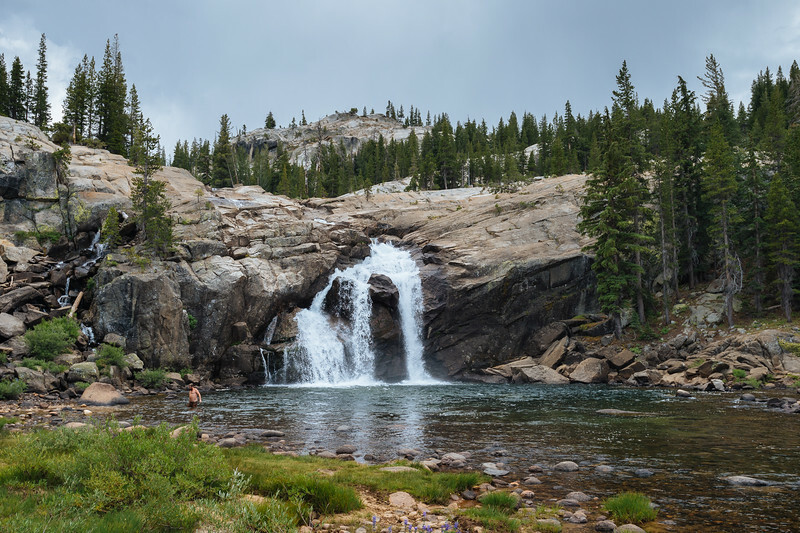 The route begins in Tuolumne Meadows and largely follows the Tuolumne River downstream for 5.5 miles or so until arriving at the Glen Aulin High Sierra Camp, which sits adjacent to a very lovely waterfall. The photos above are my four best snaps of the day in the order that I took them. The weather was threatening much of the afternoon but I didn't get those super dramatic clouds that would have helped the photos a bit. The black-and-white photo above is from a good vantage point, but just doesn't have that oomph that it needs to work. Then again, I would get my dramatic clouds the next day at the Gaylor Lakes. One thing about the trail: Most people start at either Lembert Dome (where there's parking) or the bridge over the Tuolumne River near the Parsons Lodge. That's fine, but it does mean the first two miles are spent on a very dusty and sandy section of the trail that climbs over a small ridge away from the river. Those who know the area may find it's better to start at the Pothole Dome trailhead, head downriver and then cut across the river (easy in low water) and pick up the trail again in the large meadow about one mile in. All pics taken with my Nikon Df and either the Nikon 18-35mm 3.5 lens or the Nikon 50mm 1.8 lens. I used a tiny pocket-sized tripod for the Tuolumne Falls shot, a half-second exposure (some rocks helped the tripod). I also put a nine-stop neutral density filter on the 18-35 lens. Check out more of my work at my main photo website, including info on buying prints and licensing. The photos above are ©Steve Hymon and may not be used elsewhere without my advance written permission. All rights reserved.